Thursday November 28th 1901 We got up early and I ironed before we went down to Otts to dinner. The Bremers were there we had a nice visit and a fine dinner. I did churning and sewed in the evening. I was busy with the work all forenoion. we had dinner early and Will and I went to town. We called at Lathrops. They are going away. I called at Mrs Rich and we stopped at Woolfs. I sewed in the evening. weather very pleasant. Saturday November 30th 1901 I was very busy doing baking all morning and putting down the stair carpet. Will went to town in the afternoon and I went down home. I was busy in the kitchen most of the evening. Sunday December 1st 1901 I put the house in order and got a nice dinner. The Spencers with Mollie came about eleven oclock. We enjoyed their visit. Otts 40th birthday. 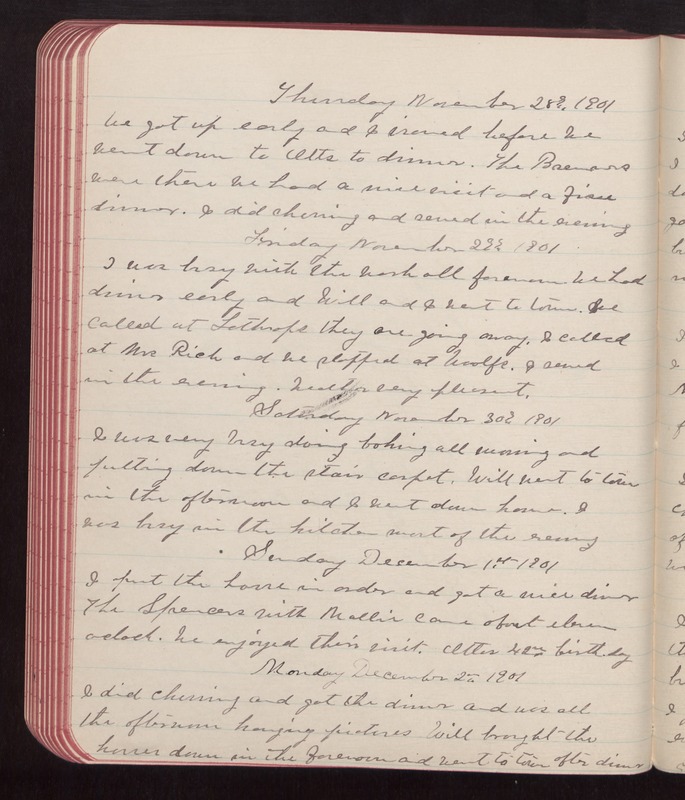 Monday December 2nd 1901 I did churning and got the dinner and was all the afternoon hanging pictures. Will brought the horses down in the forenoon and went to town after dinner.